No two drummers are the same, and every player has their own distinctive style. Getting a sound that you’re happy with, not to mention having the right sound for the gig, is vital. But it can be expensive and time consuming trying to find out what works. Enter the TM-1—a unique trigger module that makes it easy to add more sounds to your acoustic drum kit. And those sounds can be anything you like, from the TM-1’s onboard kick, snare, tom, cymbal, and percussion samples to your own samples and loops. 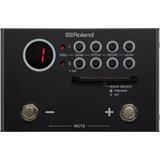 Just connect any compatible Roland trigger pad to the TM-1 and directly play the sounds you need, or mount an RT-series trigger to one of your acoustic drums and play with your preferred sample layered on top in perfect sync, with no lag whatsoever. Getting your own custom sounds into the TM-1 is a breeze, thanks to the free editor app for Mac/Windows and iOS/Android. * Simply connect the TM-1 to your device, open the app, import samples from your library, and tweak the settings as needed. When it comes to performing on stage, the battery- or mains-powered TM-1 can be easily controlled with your foot via built-in switches. It’s even possible to mute the hybrid sound with a foot press, letting you go all-acoustic in the verses before bringing in some extra hybrid power for the chorus. Every working drummer can benefit from a hybrid setup these days, and the TM-1 is the easiest and most affordable place to start. *Android app available in March 2019.